You will have online access for 12 months to complete any Teflen course. If you require more time, please contact your trainer. You do not need any particular qualifications for our courses, but you must be able to speak English fluently. Once you have successfully completed the course, you will receive your certificate. Use your unique certificate ID number, plus your username & password to download a high resolution certificate (PDF) for printing. Share your certificate ID number with employers for course verification without the download. Your certificate will be kept safe for you to download day or night. A Lifelong Teflen TEFL/ TESOL certification gives you freedom and flexibility to teach English abroad whenever you wish in the future. No! Many countries, particularly in Latin America, are happy to work with teachers who have little or no college. However, many countries do require at least a Bachelors Degree. The qualifications required by employers will vary widely depending upon the demand and availability of teachers and the work visa requirements in your country of interest. Will I find work without teaching experience? Absolutely! Most people teaching English abroad have never taught before. Most non-native English speakers learn English in formal settings from local, non-native English speaking teachers. These teachers often have poor speaking skills and are not able to handle advanced students. Even if you don’t have teaching experience, you do have years of native English experience, and that is precisely what most people are looking for in a teacher. Is it necessary that I speak the language of the country where I will teach? No. Language classes are best taught using an emersion technique. The same way you will learn a language very quickly by moving to that country and being immersed, so will your students learn much faster by having their class completely in English. That’s what they’re paying you for! Some schools do appreciate it if you know some of their native language, if for no other reason than to be able to handle yourself more comfortably in the work environment. That being said, few people who are interested in teaching abroad speak the local language before they go. It is advantageous for you to know some basic local language phrases of the country where you will teach but it is certainly not necessary to be fluent. Many schools offer language classes and social activities to help familiarize their teachers with the local culture. Having a little background of the local language will understand the causes as to why certain diction, grammatical, and pronunciation problems arise, and you can address them better as well. How much money do I need to start out? You need money for your first month's rent, deposit, food, and transportation costs, plus extra money for emergencies. We recommended taking at least $1,500+ USD to cover 4-6 weeks of housing food, transportation before your first paycheck. In Europe and Japan, you will need as much as $3,000+ in start up money due to higher cost of living in these countries. You will be paid the local wage rate. Keep in mind that cost of living varies widely and that you will always be paid a livable wage no matter where you go. In many developing or emerging countries teachers are paid only a fraction of what they may earn in Western countries, cost of living is low that the salary covers your living expenses. Teachers in Europe make enough on their 25 hours a week to break even. They make enough to cover standard expenses of housing, food, transportation, and have a little pocket money. In Asia and the wealthier Middle Eastern countries teachers typically earn enough to save 30-50% of their salary. Many teachers decide to tutor privately in addition to their main job. Private tutoring is a chance for you to double the hourly wage you make at your school. Is it necessary to have a TEFL / TESOL certificate to teach English abroad? Most schools now require that teachers have a degree and a TEFL / TESOL qualification. This is not only a preference of schools, but is increasingly becoming a requirement of Immigration Authorities in order to process work visas and permits. Having a TEFL / TESOL qualification will also give you an advantage in a competitive work environment. Which schools cover the airfare? China - A high percentage of teachers receive free or a reimbursed airfares. South Korea - Free or reimbursed airfares are the norm. Countries in the Middle East – Saudi Arabia, Qatar, Bahrain, Oman, Kuwait , United Arab Emirates (Dubai and Abu Dhabi) you will typically receive contracts that provide airfare to and from your home country. Asia: Hong Kong, Indonesia, Japan, Malaysia, and in some cases other Asian nations. Countries that hire without a college degree? With a TEFL certificate and native-English speaking abilities, you have all you need to provide your students with high-quality language instruction. China, Spain, Mexico, Costa Rica, Argentina and Russia are among the most popular countries to teach in without a college degree, as well as the most actively in need of English teachers. Can I still teach english abroad if I don't speak the foreign language? Remember that you are in demand and qualified to work as an English speaker because you are a native English speaker (or a very fluent non-native speaker). The very first thing your employer will tell you is they only want you to speak English to the students. In addition, according to the principles of modern language instruction, you as the teacher will want to immerse your students in an English-only environment. Some schools actually prefer more mature teachers, especially if their clientele are mainly business people. Others consider—rightly or wrongly—that younger teachers are more "dynamic". Some countries are so desperate for teachers that age is irrelevant. EFL teachers can be any age from 18 to 80, though it has to be said that it is more difficult to find employment under 21 and over 50. Also, some countries have compulsory retirement ages of around 60 or 65. But in general, don't let the question of age put you off. With a good TEFL certificate, you will find employment somewhere. Are Teflen courses written in American or British English? 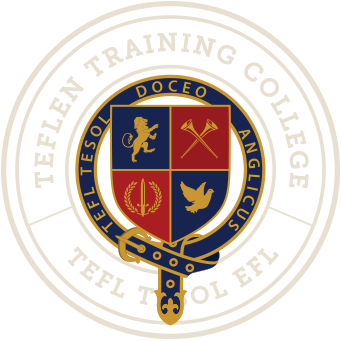 As Teflen operates internationally Teflen courses are constructed using a mixture of both British English and American English. These terms only really apply to spelling rules, and some vocabulary. The course is developed with the goal of being easy to understand. Depending on which course you chose to study you will face different assessments. Some of these are automated tests which are marked immediately online. Others require you to send material to your trainer. All assessment items are all explained clearly in the course. Do I need to buy textbooks for the course? No. All of the study material is provided within the Teflen course. However, a teacher can never be too well informed. It is advised that you buy a good grammar book, and do some independent research. Does the course provide any teaching practice? Teflen Training College exists online and therefore cannot offer teaching practice within the course. However, there are numerous practical opportunities for volunteer English teachers. You should start your search in your local area. I don’t understand the grammar section of the course? Grammar can be a difficult subject for native speakers, who generally don’t need to examine English in such a way. Take your time and look at the examples given. Practice making your own examples. Buy a good grammar book and compare our course with their explanation. Why doesn’t my course include information on Business English or ESP? You have not enrolled in the Master course. The more comprehensive the course the longer the hours it will take to complete it. Only the master course includes information on Business English and ESP. Teflen assessments are automatically set up to allow you 3 attempts to pass a test. If you fail on the third time you will fail the course. If you continue to study and complete all modules, you will receive a certificate of completion, but not a certificate of accomplishment. Can I skip through the course to the tests? No, each module must be completed before moving on to the next. Later modules will remain locked until you have finished the module you are studying. Once completed, you are free to go back and revisit any modules you wish. Which course do I need to study to get a job? While no course is absolutely essential to a find volunteer work, any level of training is better than none. In countries with thriving ESL job markets, most teachers have completed courses of 100 hours or more. Virtually anywhere throughout Europe, Middle East, Asia, Central and South America.